Wonderful piece of news yesterday - if you weren't involved. In the Amish communities in Ohio there has been a fight brewing. Culminated in 16 people being arrested on charges of hair and beard cutting. I didn't know that hair cutting was a crime! In Amish communities apparently women are not meant to cut their hair ever and men can't cut their hair or beards after marriage. 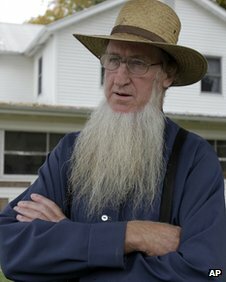 But in this particular attack a group of Amish lead by the aptly named Samuel Mullett - pictured here - went to a group of Amish that had broken away from his group but were still living Amish lives and not only cut the hair of the men in this community but also took photos. They then hid the evidence - shears, hair and disposable camera!